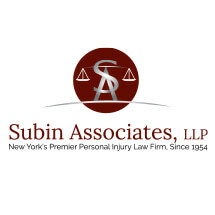 Since 1954, the Manhattan law firm of Subin Associates, LLP has been protecting the rights of New York residents injured in accidents that should never have happened. Our personal injury trial lawyers have helped clients recover more than $750 million in compensation for accidents that have caused significant injury and emotional trauma. Our Manhattan law firm represents clients throughout New York City, including the Bronx, Queens, Brooklyn and Staten Island, as well as Upstate New York, including Westchester County, and Long Island. We also represent clients who have lost a loved one in an accident caused by carelessness or negligence in wrongful death claims. At every stage of a personal injury or wrongful death case, you will find our attorneys and staff to be kind, caring and accessible, while simultaneously fighting aggressively and skillfully to hold negligent parties and their insurers accountable. Learn more by contacting the firm for a free initial consultation.